Corona Arch near Moab, Utah. The arch has become popular for adrenaline junkies seeking a thrill by swinging through the 140-foot sandstone arch. 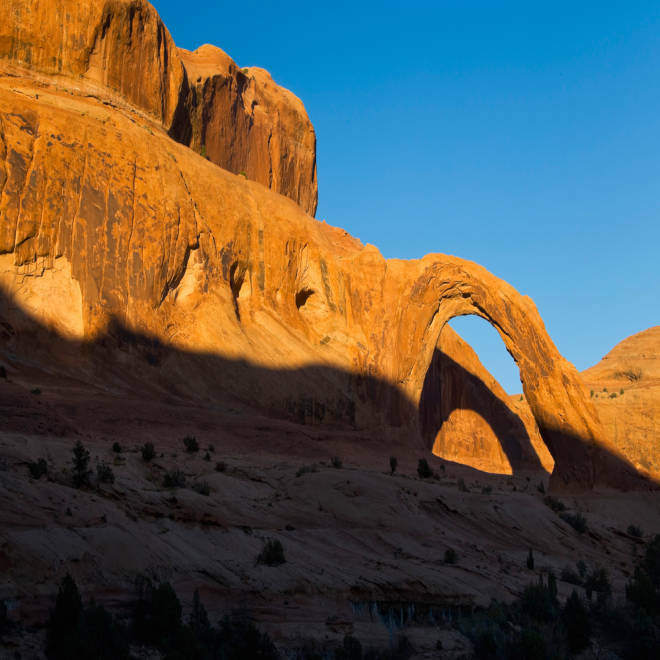 A 22-year-old man recreating what has become a popular stunt was killed after apparently leaving too much slack in the rope he was using to swing through a sandstone arch in Utah, police said Monday. Kyle Lee Stocking, of West Jordan, and five friends hiked to the Corona Arch in southeastern Utah on Sunday to attempt the stunt made famous on YouTube. But Stocking miscalculated the length of the rope he used to swing from the 140-foot sandstone arch and struck the ground when he jumped, according to the Grand County Sheriff's Office. County deputies, search and rescue personnel, and paramedics all responded to the accident, but Stocking was pronounced dead at the scene. Internet videos have popularized the dangerous activity, which involves using a rope to swing like a pendulum through arches and canyons. A YouTube video titled "World's Largest Rope Swing," shot at the same arch where Stocking attempted his swing, has garnered more than 17 million views since being posted last month. By Monday night, the comments page attached to the video had largely turned into a debate about the safety of the activity and the wisdom of bolstering it through a well-produced video. This video of people swinging from the Corona Arch has received more than 17 million YouTube views since being posted in February. Previously, hiking and adventure companies could charge to take daring patrons to the top of the arch for their chance to get the swing of a lifetime, according to the Salt Lake Tribune. But earlier this year Utah state officials outlawed the activity, largely because of the danger posed — and a forthcoming land exchange between the state's School and Institutional Trust Lands Administration (SITLA) and the federal Bureau of Land Management. The arch has nevertheless remained open for private parties wishing to climb or swing. "If people want to huck themselves off a cliff or arch, that’s their business," John Andrews, SITLA’s general counsel, told the Tribune in February. "There is a general principle that owners who hold their land open for recreational use are insulated from liability. We felt there was more risk [exposure to the state] if someone operated under a permit and someone got hurt." Yet prohibiting commercial outfitters from professionally charging for swinging adventures has raised objections from those who say people will swing regardless, so it would be better to do it with some professional oversight. "If you don’t do it exactly right, you can die," Thad James, owner of the Utah outfitter High Adventure, told the Tribune when the ban first went into effect. A spokeswoman for the Bureau of Land Management told the Associated Press on Monday the agency will be "taking a closer look at appropriate ways to balance and manage these activities on public lands."